The Victorian Public Sector Commission (VPSC) has created the Development Framework for Victorian public sector managers to establish a common understanding about the knowledge, skills and behaviours required for success in any Victorian public sector management role, regardless of the specific context in which the role is performed. 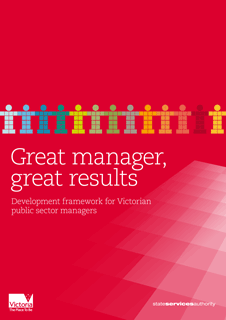 Used to shape the professional development of emerging and experienced managers, the Development Framework will contribute to the ability of Victorian public sector managers to move easily from one role, situation or environment to another. This provides the basis for a responsive and adaptive public sector. The Development Framework contains 13 development areas, presented in two sections: management role foundations and management role activities. 5. Thinking and acting strategically. 13. Contributing to public policy. The Development Framework is detailed in different ways for different audiences through a suite of resources collectively titled Great manager, great results. The knowledge, skills and behaviours specifically related to the Victorian Public Sector are highlighted throughout the Great manager, great results documents. The VPSC’s Welcome to government also provides more information about the Victorian public sector context. The Development Framework does not focus at all on the professional, technical or context-specific knowledge, skills and behaviours a manager may require in their role. Department and agency capability frameworks, position descriptions for individual roles, and human resources staff will assist managers to identify any job-specific capabilities they may need to develop. The order in which a manager focuses on the different development areas will, of course, depend on their existing knowledge, skills and behaviours, their experience and aspirations, and the context in which they work. However, a manager (or an aspiring manager) should focus first on developing expertise in the management role foundations. 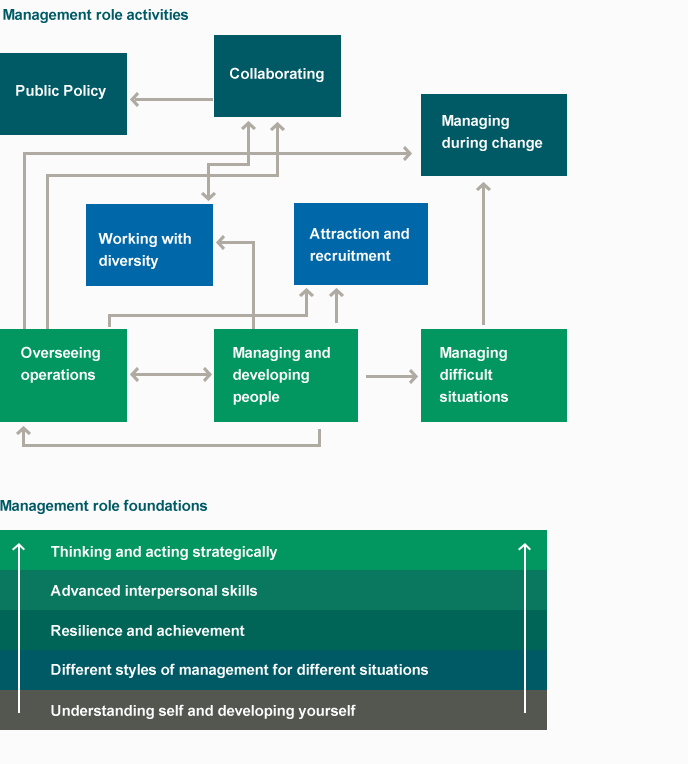 The knowledge, skills and behaviours highlighted in this part of the framework underpin the ability to succeed in all aspects of a management role. Next, a manager should focus on developing expertise in ‘overseeing operations’ and in ‘managing and developing people’. The arrows in the diagram below show how the other development areas build on the knowledge, skills and behaviours covered in these foundation areas. The VPSC has developed a number of resources that provide more information about the Development Framework for different audiences. Of course, individual Victorian public sector organisations have their own resources that managers can draw on to help them identify and address their professional development needs. Do you work in HR? The Development Framework outlines the aims and objectives of the Great Managers, Great Results project. 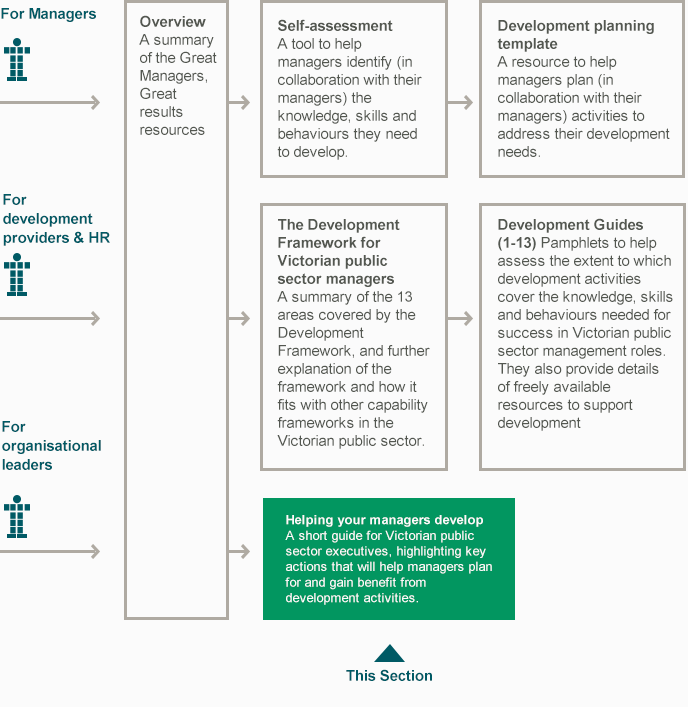 It provides a summary of the 13 development areas that cover the knowledge, skills and behaviours required for success in any Victorian public sector management role. There is a separate resource containing development guides for each of the thirteen areas. The Helping Your Managers Develop guide helps you have a conversation with the managers who report to you about the development they need. Thirteen development guides have been written for individuals and organisations that deliver development activities for Victorian public sector managers. Each guide provides information about what a development activity in that area should cover, as well as freely available resources to assist with delivery of this content. The guides are also of value to Victorian public sector learning and development staff and managers as they assess the value of different development programs and activities. Are you a manager (or do you want to become one)? The Self Assessment and Development Planning template helps you identify and develop the knowledge, skills and behaviours required for success in any management role. It also contains advice about how to ensure that development activities you undertake will be effective and how to talk to your manager about the development you need. do you manage managers?